Dr. John A. Elefteriades, has pioneered efforts in identifying the genetic roots of aortic diseases. Dr. Elefteriades, MD performs all aspects of adult cardiac and thoracic surgery, and continues more than 14 different research projects in thoracic aortic disease and cardiac transplantation. He is a recognized authority in interventions for the failing left ventricle, including coronary artery bypass grafting, left ventricular aneurysmectomy, transplantation, and artificial heart implantation. 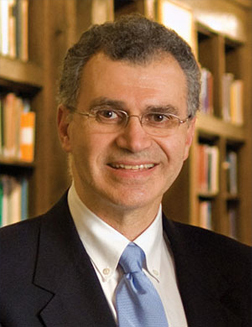 Dr. Elefteriades, is a past president of the International College of Angiology and of the Connecticut Chapter of the American College of Cardiology. He served on the national Board of Governors of the American College of Cardiology and as a member of the Thoracic Surgery Directors Association. Dr. Elefteriades, serves on the editorial board of the American Journal of Cardiology, the Journal of Cardiac Surgery, Cardiology, and the Journal of Thoracic and Cardiovascular Surgery. He is Editor-in-Chief of the journal Aorta. He is the author of more than 300 scientific publications on a wide range of cardiac and thoracic topics and is a frequently requested international lecturer, visiting professor and guest surgeon. He has lectured and/or operated in 33 countries. Dr. Elefteriades, has been named consistently as a “Top Doctor in America,” and was also selected as one of “America’s Top Doctors for Men” by Men’s Health Magazine. He is a recipient of the Walter Bleifeld Memorial Award for Distinguished Contribution in Clinical Research in Cardiology and the John B. Chang Research Achievement Award. In 2006, Dr. Elefteriades, received the Socrates Award, recognizing exceptional achievement in teaching and mentorship of residents, from the Thoracic Residents Association, Thoracic Surgery Directors’ Association, and the Society of Thoracic Surgeons. That same year, Dr. Elefteriades, was named the William W.L. Glenn Professor of Cardiothoracic Surgery at Yale School of Medicine. Dr. Elefteriades, MD is the author of the medical books: House Officer Guide to ICU Care (Edition 1 to 3), Advanced Treatment Options for the Failing Left Ventricle, Diseases of the Aorta, and Acute Aortic Disease. For the general public, he has written Your Heart: An Owner’s Guide, The Women’s Heart: An Owner’s Guide, Extraordinary Hearts, and the medical ethics thriller, Transplant.